Columbia, MD – More than 60 leading retinal disease clinical researchers from around the world gathered in Baltimore on June 11, 2018 to discuss findings from ProgStar, the Stargardt disease natural history study launched by the Foundation Fighting Blindness Clinical Research Institute (FFB-CRI) in 2013. FFB-CRI invested more than $6 million in the international study. The prospective arm of the study followed 259 Stargardt disease patients for two years. The retrospective arm enrolled 251 patients, and the last patient visit was in 2017. To date, 11 study-related research papers have been published in peer-reviewed journals. Analyses of the data continue with additional publications in process. “If you build it, they will come,” said Janet Cheetham, PharmD, FFB-CRI’s ProgStar project lead, underscoring the goal of boosting industry interest in therapy development. “If clinical trial endpoints for Stargardt disease are known, drug development will be more efficient.” She noted that six clinical trials are currently underway for Stargardt disease. Progression of vision loss in Stargardt disease is difficult to measure over time using standard clinical tools like an eye chart. The ProgStar workshop on June 11 considered three disease-measurement alternatives — optical coherence tomography (OCT), fundus autofluoresence, and microperimetry — for potentially measuring disease progression and treatment efficacy in clinical trials. 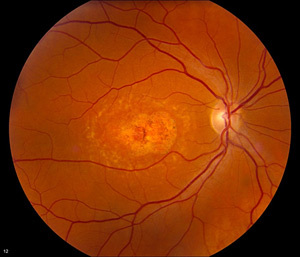 Stargardt disease leads to significant loss of central vision. It is often diagnosed in children and young adults. In most cases, the condition is caused by bi-allelic mutations in the gene ABCA4. Approximately 30,000 people in the U.S. have Stargardt disease with tens of thousands more affected in Europe and around the world.